Tour Generic Trader Online, our web platform. 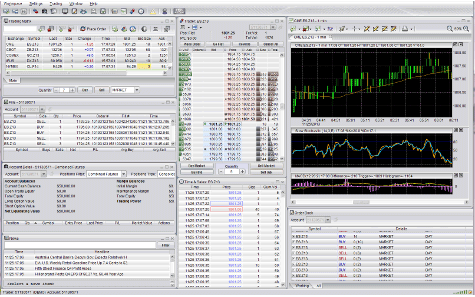 Tour Generic Trader Professional, our powerful desktop platform. 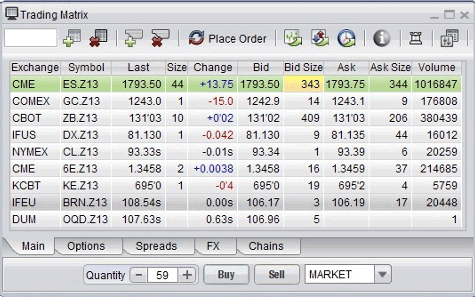 Generic Trader’s Matrix is your at-a-glance trading dashboard. Set it to monitor all the contracts and markets you’re interested in watching. 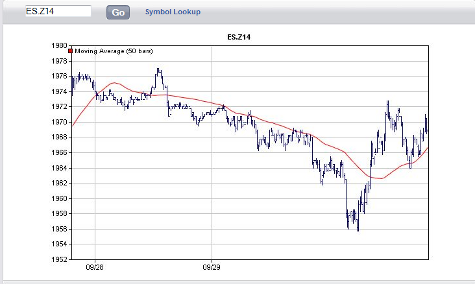 Drill down with advanced charting and market depth analysis – both just a click away. 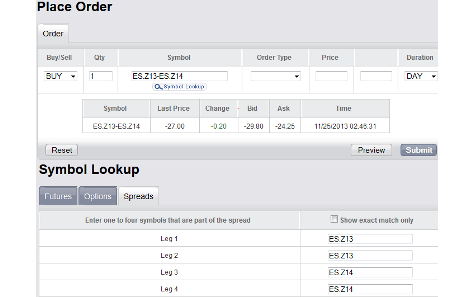 Then enable One-Click Trading for total, up-to-the-second trading control – all from a single screen. Generic Trader’s Charts deliver the analytics you need for the most sophisticated strategies, without needless complexity that just slows you down. Customize them with powerful tools and signals including Bollinger bands, three varieties of slow and fast stochastics, and many more. Add custom trend lines and pointers to support your trading strategy. 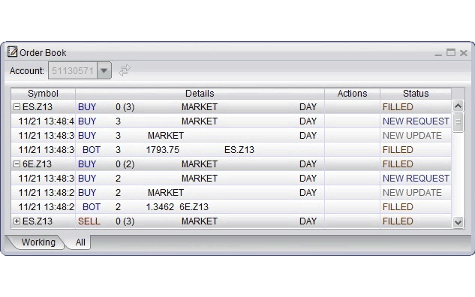 Generic Trader’s Order Book helps you monitor your orders as they are transmitted, working, filled and pending cancellation – for complete, end-to-end visibility of all your trading activity. Keep an eye on the Order Book for no-surprises control – even during volume spikes, and no matter how actively you trade. 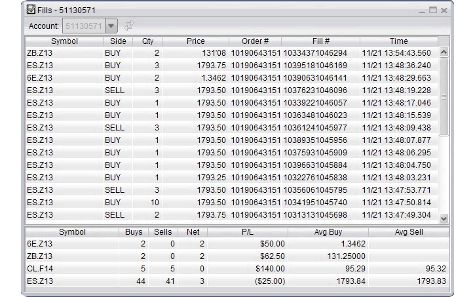 Generic Trader’s Fills Window delivers an up-to-the-second summary of your current-day trading, with order-by-order detail and daily position summaries to guide your strategies as you execute them. The Positions window summarizes long, short and net positions for each contract, with a P/L to help you track performance toward your goals. 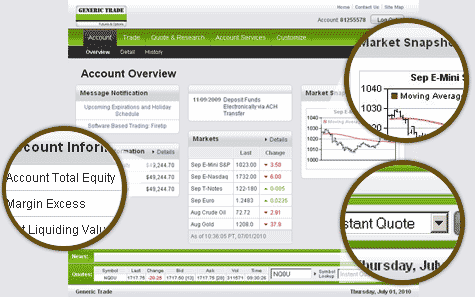 Generic Trader’s Account Detail helps you monitor trading activity with an instant update of your current account balances and positions, in real-time with tick-by-tick updates. Linking all of your trades whether on the Generic Trader Professional, Online or Mobile, it keeps you up to date and in control – no matter how or where you placed your trades. 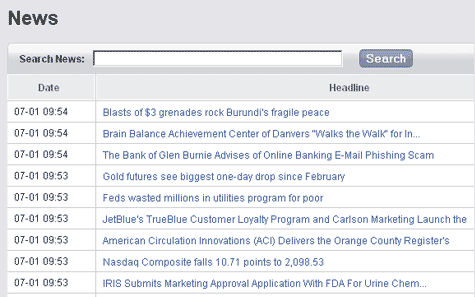 Generic Trader’s news feed keeps you focused and up to date, not distracted. 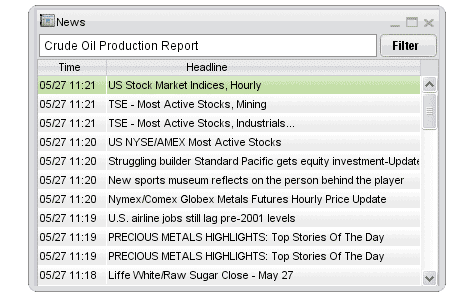 Integrated right into your trading platform, the news feed delivers immediate access to breaking news and time-sensitive economic data – and alerts to scheduled releases of information, so you can set up trades in advance. 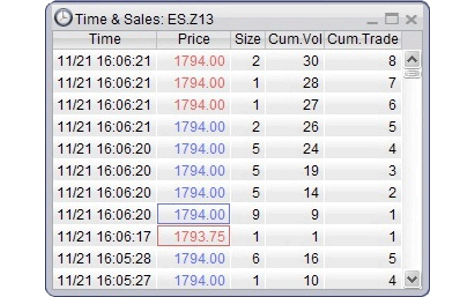 Generic Trader’s Time & Sales screen shows the actual unfiltered time and price of every transaction, the instant they occur. Now you can see your filled order along with every order filled at the exchange! All of these features and more are available with Generic Trader Professional, our desktop trading platform. Get started using either of the links below. This is Generic Trader Online’s homepage. At a glance you can see market conditions, your account information, important notifications, scrolling news topics and you can even submit an instant quote. 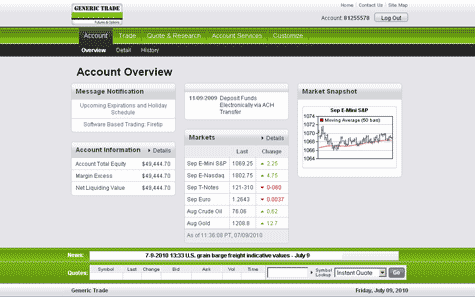 The account detail page offers a comprehensive view of your entire account; including cash balances, open trade equity, option values and net liquidating value. 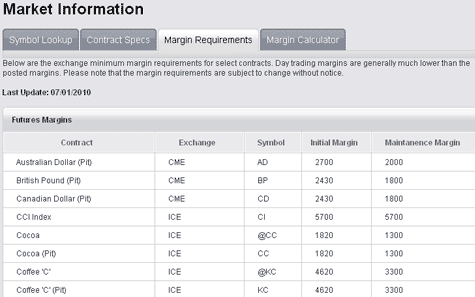 Additionally available on this page are your margin balances; including initial and maintenance requirements, total equity and your trading power. Most importantly, all information is instantaneously updated. 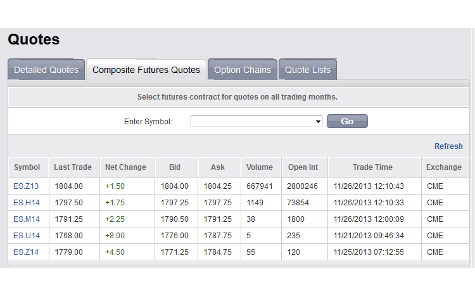 On this page you may place orders for futures, options, futures spreads, option spreads and even security futures. Additionally there is a preview screen that will allow you to see the market conditions and the details of your order before it is placed. 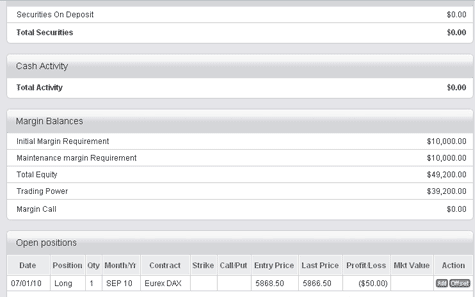 This is a convenient feature that allows you to view existing trades and either offset or add to the positions. On this screen you will see the details of all placed orders on one page. You will see the time and date of the original order as well as the resulting fill or working status. 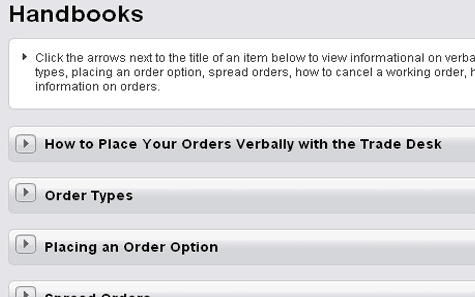 For working orders you can cancel or modify directly from this screen. From the quotes page you have several options. You may choose to create a custom list of your favorite markets, view composite quotes of all trading months, detailed quotes of a particular market or even view a page of option chains. 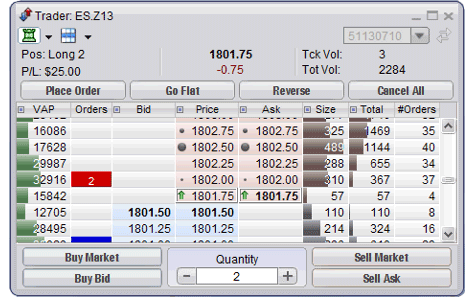 Generic Trader Online provides real-time charting for all available contracts. All the latest headlines on one screen real time. 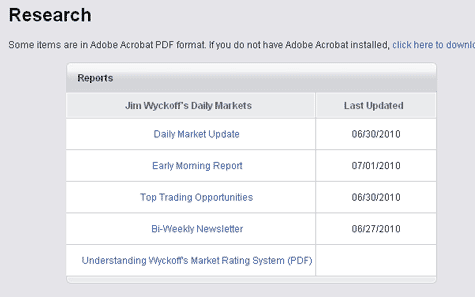 Provided by one of the top industry analysts there are several reports available; including Daily Market Update, Early Morning Report, Top Trading Opportunities and a Bi-Weekly Newsletter. This is your market resource center which offers complete contract specifications on of all available markets, daily updated margin requirements and even a margin calculator. 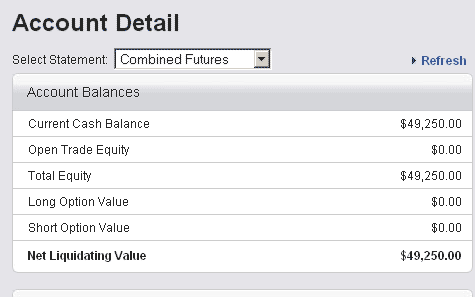 Finally you can transfer funds in and out of a futures account without having to pick up the phone. 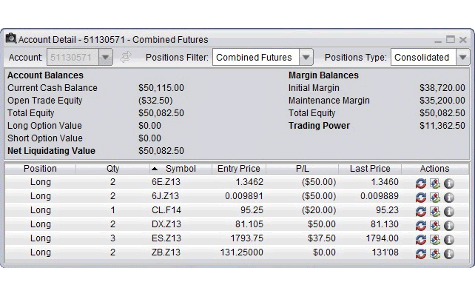 Whether you would prefer to wire funds or use the Automated Clearing House (ACH), it can be done directly through this control center on Generic Trader. Here is the place to go to brush up on all of your order placing knowledge. All of these features and more are available with the Generic Trader Online Platform. Get started using either of the links below. The Mobile app’s Account Detail page helps you monitor trading activity with an instant update of your current account balances and positions, in real-time with tick-by-tick updates. Linking all of your trades whether on Mobile, Generic Trader Professional or Generic Trader Online, it keeps you up to date and in control – no matter how or where you placed your trades. The Mobile app’s Order Book helps you monitor your orders as they are transmitted, working, filled and pending cancellation – for complete, end-to-end visibility of all your trading activity. Keep an eye on the Order Book for no-surprises control – even during volume spikes, and no matter how actively you trade. 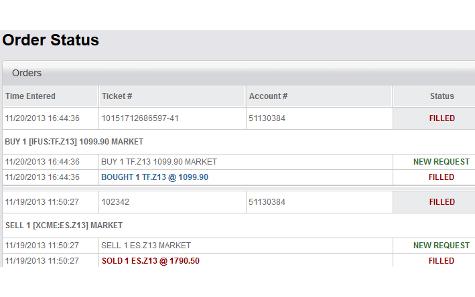 When it comes to day trading the markets, the Advanced Trader allows the user to trade, view Depth of Market, P&L (profit-loss), as well as many new features that make your trading experience much faster and easier, such as a variety of one click order placement. The Mobile app’s Charts deliver the analytics you need for sophisticated strategies, without needless complexity that just slows you down. Customize them with powerful tools and signals including Bollinger bands, varieties of slow and fast stochastics, MACD, RSI and many more. 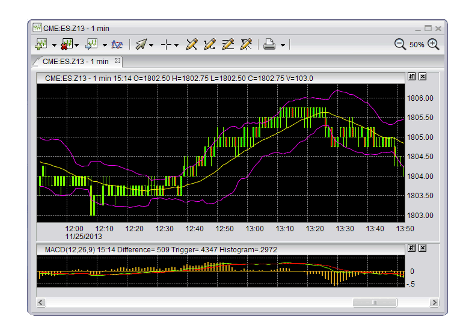 Customize with a variety of chart types and bar units to support your trading strategy. The Mobile app’s Trading Matrix is your at-a-glance trading dashboard. Set it to monitor all the contracts and markets you’re interested in watching and not only will you have tick by tick real-time streaming quotes, but you will be able to place orders or navigate directly to the chart or Advanced Trader screens. Giving traders what they want. All Trades 59¢. Try out our technology for free or open an account and start trading. We employ comprehensive safeguards; financially by the NFA, CFTC and various exchanges as well as during trading, by having 24 hour support and cross-country data centers…more security info. 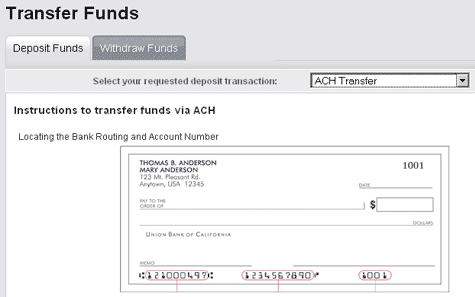 All accounts, regardless of size or volume, are 59¢ commission per side. All fees are fully disclosed. Low Cost + High Tech = Value …more about value.